CHICAGO – As part of its ongoing work to support the public library’s role in creating healthy communities, the Public Library Association (PLA) is taking steps to increase consumer education around health insurance. PLA's health insurance education initiative, Promoting Healthy Communities: Libraries Connecting You to Coverage, is part of a national partnership made possible by funding from the Robert Wood Johnson Foundation (RWJF) and Community Catalyst. As the next phase of this partnership, PLA is offering funding for public libraries to implement consumer outreach and education activities around health insurance and health information. Up to 70 U.S. public libraries will be awarded $500 mini-grants through an application process beginning Feb. 12. The Round 2 mini-grant application will remain open until 11:59 p.m. Central Time on Tuesday, Mar. 5, 2019. Priority will be given to recipients of first-round Libraries Connecting You to Coverage funding and grant-associated activities must be completed by May 1, 2019. "Health insurance can be confusing, complicated and potentially expensive, which is why the work public libraries are doing, by serving as a 'go-to' health resource for consumers, is so very important," says PLA President Monique le Conge Ziesenhenne, PhD. Last fall, PLA partneried with RWJF and Community Catalyst to address a shortened period for enrolling in the Affordable Care Act (ACA) marketplace and reduced funding for enrollment Navigators. For 2018, only $10 million in government funding, an 84% reduction, was given to 39 organizations in the 34 states with federally-facilitated marketplaces for “Navigator” grants. PLA distributed quality materials and communications, and made $300 mini-grants to 66 U.S. public libraries (PDF) across the U.S. The libraries used these grant funds to disseminate, offer education, and encourage their communities to enroll in the health insurance Marketplace during the Open Enrollment period. According to the Centers for Medicare & Medicaid Services, almost 8.5 million people in the 39 HealthCare.gov-participating states enrolled in coverage during the six-week open enrollment period in 2018. This represented a 4% decrease compared to the prior year’s open enrollment numbers, and the drop was much smaller than anticipated. All public libraries, regardless of whether they apply for a PLA grant, are encouraged to take advantage of PLA's health insurance literacy resources. 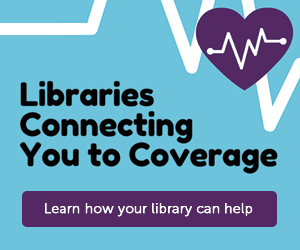 Visit the Libraries Connecting You to Coverage web page for posters, flyers, videos, ready-made social media ads and graphics, answers to frequently asked coverage questions and more. Questions about the initiative and grants may be directed to Leighann Wood, PLA program manager, at lwood@ala.org or 312-280-5867. The Public Library Association (PLA) is the largest association dedicated to supporting the unique and evolving needs of public library professionals. Founded in 1944, PLA serves nearly 10,000 members in public libraries large and small in communities across the United States and Canada, with a growing presence around the world. PLA strives to help its members shape the essential institution of public libraries by serving as an indispensable ally for public library leaders. For more information about PLA, contact the PLA office at 1 (800) 545-2433, ext.5PLA, or pla@ala.org.